This is the first part of a two-part post. The second part is at this link. When I went to North Carolina for my marathon last week, I had time to check out some of the breweries and taprooms in the part of the state where I was traveling and staying. Part of this included a visit to Asheville, and if you're familiar with that area, you know that there is just too much outstanding beer coming out of Asheville to consider one visit conclusive. I did visit all three of the major breweries in the Asheville area, including New Belgium, Oskar Blues, and Sierra Nevada. Those tours and tastings were ninety minutes to two hours each, and I'll post separate blog entries for each of those breweries later. For the most part, my taphouse visits were more about relaxing and sampling the beer and food, not about blogging. But I did make a few notes about six of the taprooms I visited during my stay in western North Carolina, and I'll post them, along with a few pictures, here. These reviews, like the Richmond reviews, reflect my experiences during a brief visit, and they should be regarded as such. One brief visit is not really enough to sum up or adequately assess any taproom's oeuvre. But I will tell you a little about what I enjoyed. This is part one of a two-part North Carolina indie taproom review. This may be the oldest of the local, independent brewing companies in Asheville. It certainly predates the boom of Asheville breweries (more than 25 now) over the last ten years. Asheville Brewing has three locations, and I visited the taproom at 77 Coxe Avenue. I think this is the oldest of the three locations, but I'm not completely sure and I just didn't think to ask while I was there. It's certainly an old building, and the taproom itself has a friendly local bar vibe, in contrast to the large, family-appropriate social room feel that many modern taprooms seem to go for. 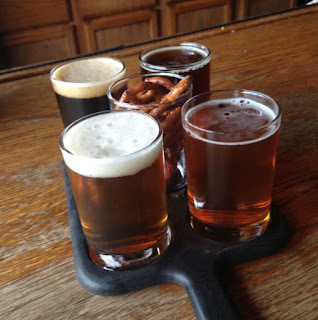 Asheville Brewing, like most taprooms, does flights of four for people who want to sample a few different things. I had the Hot Fuzzz Pale Ale, the Shiva IPA, the Ninja Porter, and the Ninjabread Man Spiced Porter. I enjoyed all of them, particularly the Ninjabread Man porter. This was more than just a ginger-spiced version of the Ninja Porter, I thought it was a thoroughly better beer. Ninja Porter by itself was fine, but to my palate, the ginger version had a denser malt backbone and all around more robust presence. Before I left I also had a short glass of Asheville Brewing's Carolina Monster Imperial Stout, which was not available to taste in a flight. It was well worth a full glass. Carolina Monster is an imperial by any definition, it's even worthy of the Monster appellation. The stout was sweet, but not cloying, and finished with a big, roasted malt punch and a hint of the 11% ABV. I brought home some cans of other Asheville Brewing products, and I look forward to enjoying them. Located in the quiet but affable town of Morgonton, NC, Catawba Brewing Company's taproom is the front-right corner of the brewery itself. The taproom is only nominally separated from the brewery with half-walls and barriers, so you can see the brew tanks and equipment creating the beer you taste only a few feet away. Outside of the brewery on the Friday I was there, there was a food truck selling barbecue that really smelled good. I didn't get to taste the food, I was running a marathon the next morning, but I did stop in for a quick flight to taste four of Catawba's beers. I liked some of what I tasted enough to grab some cans to go at the bottle shop in Morganton, which is the only way to get Catawba singles, as far as I could tell. They don't sell the singles at the taproom, at least. In my flight I tasted the Mother Trucker Pale Ale, which had a little more kick than the fairly nominal pale ales that some breweries turn out as a flagship crowd-pleaser. I also had the Brown Bear Brown Ale, which I liked enough to bring home. This was a brown ale with a slightly tart finish that I enjoyed. Then I tasted the Firewater IPA, which I thought was nothing special, but there was some kind of unexpected, almost garlic-like note that I hadn't expected in the aftertaste. I brought home a can of that to give it a second chance. Lastly I tasted Catawba's sour, which was just too reserved and understated to compare with the other fantastic sour beers being brewed by other North Carolina breweries. As sour beers become more and more popular, I think a lot of breweries feel like they ought to have at least one offering in the style, simply to remain relevant. Catawba's sour smelled and tasted obligatory at best. This taproom was getting crowded by the time I left early Friday evening. It seems to be popular, and probably deserves to be. Like Catawba, Fonta Flora's brewery and taproom are in Morganton. In fact, the two breweries are only separated by a few blocks, which makes for a convenient walk. I glanced at the Fonta Flora website before my visit, and I wasn't immediately compelled to expect much. Fonta Flora emphasizes local ingredients and unusual ancillary flavors, like sorghum and rhubarb. Something about the way the brewery positions itself just screamed "hipster" to me. Often, I find, these kinds of breweries are really selling an image and a feeling more than they're selling quality beer. Now that I've visited Fonta Flora, I have to say, emphatically, that my initial negative reaction was wrong, boorish, and closed minded. Fonta Flora's taproom was easily the highlight of my entire North Carolina trip. This brewery did something wonderful for me, it reminded me that beer is food. And, like all well made food, it ought to please and excite the senses. It should be like a little trip to somewhere new in a glass, and it ought to set the mind reeling. Several of the beers I tasted at Fonta Flora are remarkably good. This brewery does flights of five. The first thing I tasted was their Pontoon Parade Saison, which is made with sprite melon and bee balm. I'll be honest, I don't even know what bee balm is, and I'm not sure I've ever had sprite melon. But, whatever.... I can tell you for sure that this beer is really tasty. It's bright, fruity, refreshing, and the flavor closes with something I could not quite identify. Something with a little kick that never really did more than hint at another ingredient. Asparagus, maybe? I don't know. I do know that i enjoyed every drop. Then I had the Sorghum Oktoberfest, which I did not enjoy as much, but that I liked more than most Oktoberfests. There was something weird and unexpected up front on this beer's flavor, and I suppose it was the sorghum, that made it unique. Next, I had Darwin's Forehead, a salted porter. This was the only disappointment in the flight, it had no real salt flavor that I could discern at all. It was a fine porter, but after the odd flavors that preceded it, I thought it was maybe a bit pedestrian. At this point I want to point out that my notes about the flight veer off topic for a sentence: "This bar is playing Brand New!" I wrote. Brand New is one of my favorite rock bands. I don't know if I've ever heard them in a taproom before. One more little surprise at Fonta Flora. Anyway, back to the flight. Up next, Quercus Phellos, an IPA with lactose. The lactose gave the beer's big, bitter start a nice, mellow, slightly sweet back end that provided a lot of balance. Then came the Hop Beard IPA, which was strong and dank and a little more wild tasting than I'd expected from such a clearly filtered, clean IPA. That finished the flight, but since almost all of those beers had been very good, I decided that I'd like to taste one more beer. That was the best beer related decision I made during my North Carolina trip. Fonta Flora had something on the tap list called Underground, an "Appalachian Style Brezelvass." I'd never heard of the brezelvass tyle before, so I Googled it, and the first result took me to the brewery's instagram page. OK, so it's a style the brewer made up, I thought. But, that's fine. Really, his beer has been so good across the board that I'm curious about what else he's cooked up. Plus, the Underground had such a low ABV (2.8%) that I felt confident that I could have a glass without worrying too much about how it might effect my walk back to the hotel. I ordered an eight-ounce glass. I spent the first couple of minutes just smelling the beer and trying to figure out what I was smelling. I still don't know how to describe it. There was a lot going on in this beer's aroma. It was bitter, it was spicy, it was rich, it was funky. It was unlike anything I'd ever smelled before. There are several disparate things going on simultaneously in this beer's aroma, but it All worked well together. I honestly cannot compare it to another smell. I will just say that this beer smelled the way Faith No More sounded in the mid 1990's. Before I ever took the first sip I asked the bartender for a bottle of Underground to go. I left Flora Fonta feeling more like I'd been to a fantastic farm-to-table restaurant than to a taproom. I think I mumbled the word "Wow" to myself ten times on my walk back to where I was staying. I predict that this brewery is going to make quite a name for itself. I'll be amazed if it doesn't. And, all of that is wordy enough to more than fill one blog post. I'll write part two, highlighting three other independent NC breweries, tomorrow.